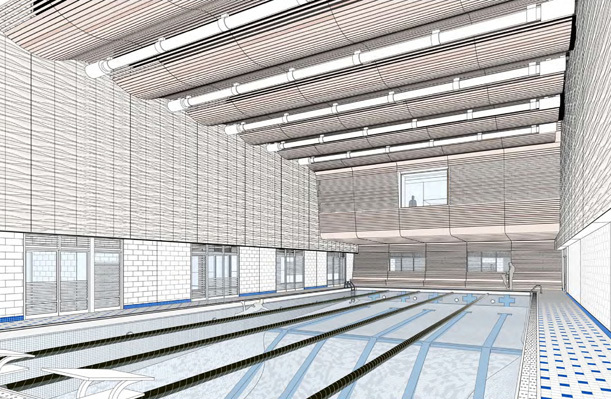 Helpern Architects’ design for the renovation of the swimming pool in Haaren Hall has earned approval from John Jay College of Criminal Justice, the City University of New York, and DASNY, which is the project manager. Construction drawings are scheduled to be completed by November, followed by eight months of construction. The $5.75-million renovation within the five-story building, located at the corner of Tenth Avenue and 58th Street in Manhattan, will provide new ADA-compliant locker rooms and support spaces and replace the pool’s finishes. New pool filtration and pump equipment, lighting, and MEP/FP systems are also part of the project. All physical changes will meet NCAA standards, as the pool is home to the college’s women’s swim team and hosts several NCAA Division III swim events each year. The Helpern design for the space features a new suspended teak ceiling. Narrow slats of teak – harvested from Forest Stewardship Counsel-certified sustainable forests in Mexico – will also frame the pool’s spectator viewing window. A band of porcelain tiles will be added above the current white glazed-block walls, and the entire pool shell and floor will be reclad in mosaic tile with multi-colored accents. Haaren Hall, known formerly as both De Witt Clinton High School and Haaren High School, was purchased by New York State on behalf of the City University of New York in 1988. The pool in the century-old building was last retrofitted as part of a 1986 renovation. Since 1981, Helpern Architects has executed a variety of projects for the City University of New York. Most recently, the firm designed new administrative facilities for LaGuardia Community College, for which it also produced the master plan.